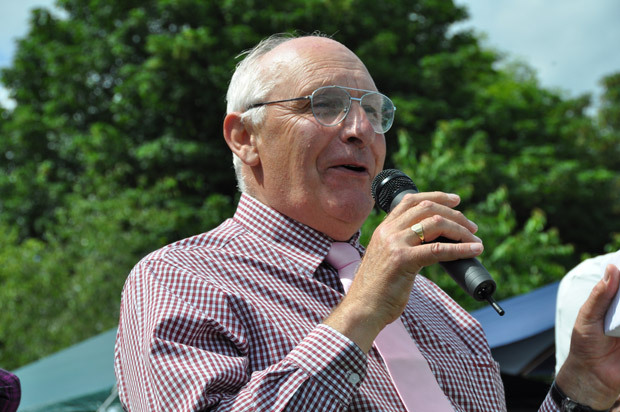 The hard work of Crosspool Forum Chairman Ian Hague was recognised on Saturday when he was presented with an award for his contribution to our local community. The Crosspool Community Award, or Crosspool Person of the Year as it is sometimes known, was set up in 2013 by Crosspool Forum to acknowledge commitment, accomplishment and achievement by individuals in the neighbourhood. Retired Lydgate Junior School headteacher Sue Havenhand was the first person to receive the award last year, and following public nominations and a vote at an Open Meeting it was decided that Ian should receive it in 2014. 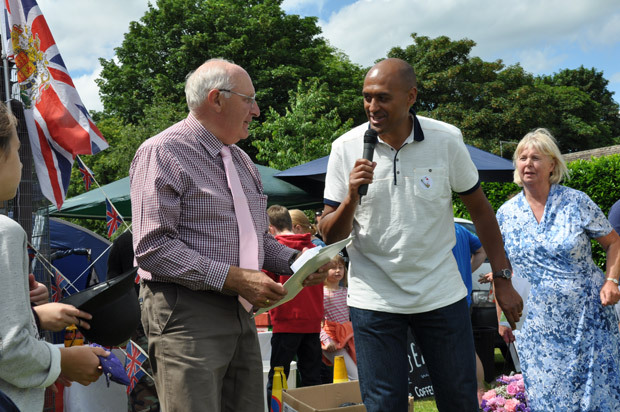 He was presented with the award at Crosspool Fayre on Saturday and gave a short speech to say thank you and explain his motivation for all his Forum work, which is to bring the community together. Ian moved into Crosspool with his family in 1972, where his children grew up in the area before going to universities, getting married and having families of their own. He worked for the CIS until his retirement in 2002. He was unable to hang up his working boots altogether, taking a couple of part time jobs helping out in Crosspool’s Greencross Chemist and also Kathryn’s Flower shop in the precinct. The idea for Crosspool Forum came in late 2002, under the auspices of David Aspinall, then South West Area Coordinator. In June 2003 the Crosspool Forum was launched and run by volunteers under the watchful eye of Ian and Barry Clay. It has also worked to bring to light significant local planning applications, including the proposed convenience store at Motor World site in 2010 and more recently Moor View Farm. The introduction and editing of the Clarion quarterly newsletter delivered to over two and a half thousand local households in the area. In 2008 the installation of a bench, made possible by generous donations, was a welcome addition to the precinct. 2010 saw the launch of our website, Crosspool News. Today you can also keep up to date by following us on Facebook and Twitter. Crosspool Festival, Summer Fayre and street markets. Various local computing training courses bringing computer skills to the more mature residents of Crosspool, and recently Tai Chi which is becoming very popular. Since the launch of the Forum Ian’s drive and determination was to bring the community together, work with council officers, local councillors, schools and police, to improve and enhance the community in which we all live and work, promote a community spirit, and to preserve and improve Crosspool’s first-rate access to the countryside, village atmosphere, good neighbourliness and general character of the local area. Over the last eleven years Ian has certainly achieved this goal. This entry was posted in awards, crosspool, crosspool festival 2014, news and tagged community award, crosspool forum, ian hague, person of the year, steve reynolds. Bookmark the permalink. Well done Ian. Thank you so much. It really helps pull us together. A well deserved award indeed. Rob. Congratulations on winning the award, Ian! We also caught the bus from Malin Bridge and got off before the Rivelin Post Office to get to Blackbrook where we had a picnic in 1946 with about 20 members of my grandfather’s family, on my father’s side Tew, my mother being Lilian Gosney, 1st family John Gosney of Moorview farm Crosspool. We also have a photo of the Blackbrook picnic of 1946. It was the only bus that Sunday and we walked by your house to the bus stop at Crosspool. We also took the opportunity of visiting the Crookes cemetery. My family are there, and by pure chance walked passed the grave of Mary of Crosspool’s grave recently passed away known in Crosspool as a lady of kindness, and even better known for her hens and eggs. A few years ago I visited her for the first time and we walked together to the quarry which my grandfather John Henry Gosney was in charge of for his father John Gosney – but that’s another story. We also visited the Walkley cemetery accompanied by Hugh Waterhouse of Walkley, his wife is engaged with the St. Mary’s church, and they live nearby. Hugh has organisation skills and thanks to him we could find the burial spot of our great grandmother Mary Gosney nee Slack. John Gosney and Mary married 1877, but Mary died in 1890 thirteen years later after giving birth to her sixth child and John Gosney of Moor View farm married again to Mary Ann Curran. Hugh who is an intellectual also put me onto the path of finding John Gosney of Moorview farm – birth certificate. A cousin of mine asked if Hugh was a friend of mine to which I answered “I hope so”. I didn’t finish the sentence in the following paragraph of the letter I have just sent to you, sorry. …was on the page 44 of Judith Hanson’s “CROSSPOOL” where the “boy & the bike” is.